Prime factorization: 19 is prime. The exponent of prime number 19 is 1. Adding 1 to that exponent we get (1 + 1) = 2. Therefore 19 has exactly 2 factors. How do we know that 19 is a prime number? If 19 were not a prime number, then it would be divisible by at least one prime number less than or equal to √19 ≈ 4.4. Since 19 cannot be divided evenly by 2 or 3, we know that 19 is a prime number. 19 is never a clue in the FIND THE FACTORS puzzles. It’s Christmas Eve or even Christmas day, and maybe all of your shopping didn’t get done. Maybe you didn’t want to drive anyplace because of bad weather, or your favorite stores were closed early for the holiday. Well, if someone on your list likes number placing puzzles (like Sudoku or Kakuro), then I have a last-minute gift idea for you, and it’s free. 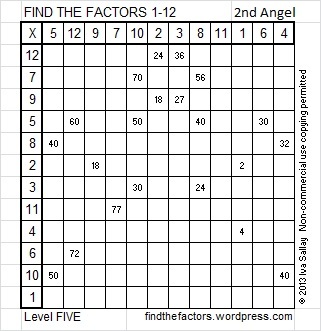 I design a number placing logic puzzle based on the multiplication table called FIND THE FACTORS. If you have a computer, the internet, and a printer, you can print a little holiday booklet filled with these puzzles and give it as a gift. If the person on your gift list is many miles away, you can even send the booklet electronically. This last minute gift is good for the brain and can be good for the memory. The level 1 and level 2 puzzles can be solved by children 3rd grade and up, but most of the higher level puzzles will be challenging for everyone regardless of age. To solve the puzzle above simply write the numbers 1 – 12 in the top row and also in the first column so that those numbers are the factors of the given clues. Okay, maybe it isn’t quite that simple. You have to know basic multiplication facts and use logic to figure out where the numbers go, and yes, I may try to trick you. But you and the people on your gift list have enough skills and persistence to find the one and only correct solution. Click 2013 Factor Holiday to download a copy of the puzzle booklet. 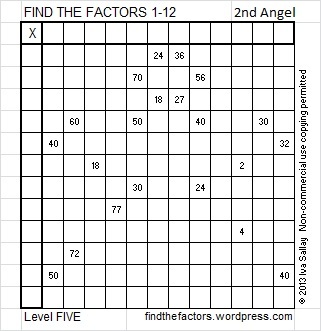 Some of the puzzles in the booklet are a little easier than the one above because they are a lower level or they only use factors up to 10. Have a very Merry Christmas and a Happy New Year! Awesome puzzle! Thanks so much for the ping! Love love love your puzzles! Thank you! You’re welcome! http://memorysmysteries.wordpress.com/ is definitely worth checking out.